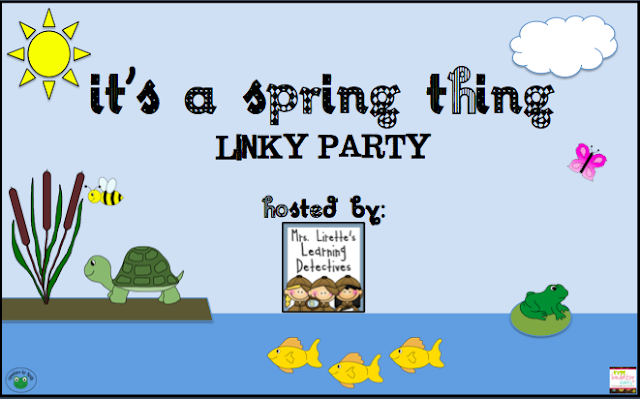 I'm linking this spring-y post to Mrs. Lirette's Learning Detective's Spring Linky Party! Tons of spring fun listed there--check it out! First we projected the first verse of the song onto the big screen and told them we were going to be reading detectives and find all of the "stuff we know" in the words to try to figure out what we'd be working on for the morning. Of course, the children loved finding and highlighting all of the "oo"s along with all of the many popcorn words they've learned this year. They discovered it was Little Bunny Foo Foo pretty quickly and we were off for some fun! This is the actual DVD of one of the versions of Little Rabbit Foo Foo. It is ADORABLE and provides a great platform for a discussion of characters, plot, and resolutions. After the video, since they were all goons, we said we needed to turn them all back into the sweet, little bunnies we knew they could be. We allowed them to make bunny hats and took pictures of all of them. 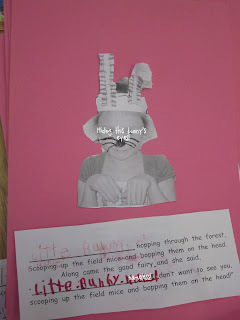 Click here to get my FREE google doc that includes the materials you need to create the following project (bunny ears to staple to a sentence strip and the fill in the blank Bunny Foo Foo poem for students to write Little Bunny their name...). A little bit of reenactment never hurt anyone! Are you nervous about targeting the 3 types of writing required to be taught by Common Core Standards? Here is an idea I had for my students and have put together for you to check out. Using one of my all-time favorite spring stories Duck! Rabbit!, students need to choose which creature it is (through a series of super, fun activities) and write their "argument" as to why it is a duck or why it is a rabbit. Included in this kit are page toppers for MANY writing starters to choose from (as well as blank pages for older writers), graphic organizers, and some super fun Duck AND Rabbit puppets in one. Huh?? Yup, it's true, you'll just have to see for yourself! Students won't forget this book if you couple it with this writing project where your students decide the answer themselves!